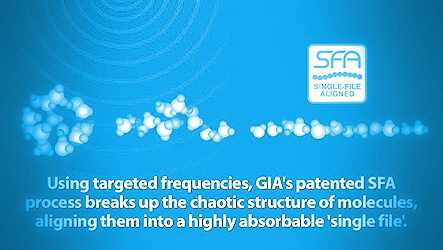 The GIA unit (shown to the left) utilizes Molecular Resonance Effect Technology (MRET) to turn ordinary (clumped or clustered water molecules) water into Single File Aligned (SFA) Water in only 30 minutes. Pitcher that holds 1/2 gallon of Single File Aligned water. The research behind the invention of this unit took more than a decade, following the Chernobyl Nuclear Plant Disaster in 1986 and the subsequent discovery of Single File Aligned Water. The activator unit (Molecular Resonance Effect Technology - noise-field generator) that sits atop the pitcher (and requires electricity to work) emits subtle energy frequencies into the water below that reorganize the clustered or clumped water molecules into Single File Alignment. The i-H2O Activator System will produce 14,400 pitchers of water (enough to last approximately 40 years when producing one pitcher (half gallon) of water per day. Of course, if you're like most people, you may soon be drinking more than one half gallon of SFA/ i-H2O (Single File Aligned) water. If you drink two gallons a day, the unit will last for about ten years . important for anyone over the age of 35. 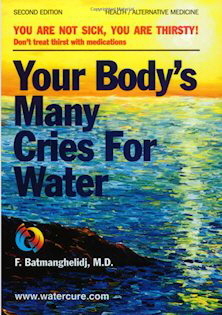 The book to the left by Dr. Batmanghelidj, originally published in 1992, explains that the lack of water in the body is a significant negative factor in regard to chronic diseases. Dr. Batman (nickname) recounts case histories of people who increased their consumption of water with very beneficial results. While completely on the right track about the importance of water, Dr. Batmanghelidj didn't realize that as people get older their bodies start to lose the ability to bring water into their cells. This deterioration in ability to bring water into cells makes it ever more difficult for older people to stay sufficiently hydrated, which is why everyone over the age of 35 should make it a point to drink Single File Aligned Water daily..
At Dr. Sinatra’s website, heartmdinstitute.com/health-and-wellness/water-important-anti-aging/ he explains that the elderly have low water reserves compared to younger people... and that dehydration is large contributor to their higher rates of disease. Popkin BM, et al. Water, hydration and health Nutrition Rev. 2010; 68(8):439-58. Chan J, et al. Water, Other Fluids, and Fatal Coronary Heart Disease The Adventist Health Study. Am J Epidemiology. 2002;155(9):827-833. Armstrong LE, et al. Mild dehydration affects mood in healthy young women. J Nutrition. 2012:142(2):382-88. Dennis EA, et al. Water consumption increases weight loss during a hypocaloric diet intervention in middle-aged and older adults. Obesity (Silver Springs). 2010;18(2):300-7. American Chemical Society. Clinical trial confirms effectiveness of simple appetite control method. 2010. U.S. Institute of Medicine. Dietary Reference Intakes: Water, Potassium, Sodium, Chloride, and Sulfate. 2005. From wikihow.com/Get-Well-Fast, the # 1 thing to do to get better faster when sick is drink more water. The amount of “proof” coming from the scientific community as to the value of hydration is irrefutable. At the same time, however, large numbers of people at all ages are living in a state of chronic dehydration, which adversely effects their health. Hydration, however, in older people, is not just a matter of drinking more water because as we age, the body loses the ability to bring water into cells. The reason is that it takes time and energy to convert clumped water (virtually all natural water is clumped) into Single File Aligned Water that will pass through aqua-porins to go into a cell’s interior. This extra energy and conversion capacity is not always available as a person ages. It is advisable, therefore, for older people to do something to assure that water goes through aquaporins. It’s even advisable for young people to make such an effort since experiments show that many young people benefit from drinking Single File Aligned Water, indicating that even though younger people convert chaotic, clumped normal water to Single File Water better than older people, the efficiency in young people is still far from perfect. So, instead of moving to the mountains of Georgia Russia to drink naturally occurring Single File Aligned Water, we suggest getting a home i-H2O Activator (shown above), and making Single File Aligned Water at home. ”Over the years, thousands of my patients have �’unbeknownst to them’ suffered from what we call UCD ’Unintentional Chronic Dehydration’. 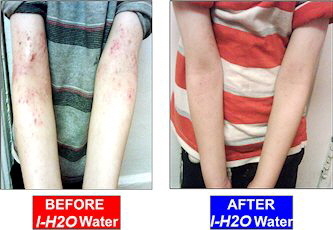 The way that the i-H2O activator makes Single File Water from normal tap or bottled water is by emitting a combination of electromagnetic frequencies that entices chaotic, clumped water to separate from other molecules into a single file of molecules that can easily enter into cellular aquaporins. 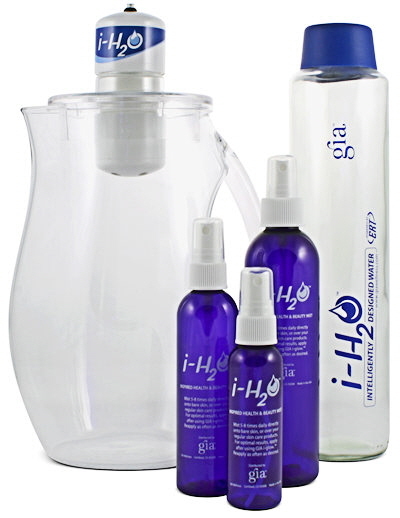 The GIA Wellness i-H2O Unit Above Turns Clumped Chaotic Water into Single File Aligned Water at Home or Office. Statements herein have not been evaluated by the Food and Drug Administration. No product mentioned herein is intended to diagnose, treat, cure or prevent any disease. The information on this website is intended as a sharing of knowledge and information from the research and experience of the sfileaw.com staff and contributors. It is not intended to replace a one-on-one relationship with a qualified health care professional and it is not intended as medical advice. You should keep in mind that cited references to ongoing scientific study are most likely not accepted by the FDA as conclusive. These references and mentions of benefits others purport to have received have not been vetted, and are disavowed as product claims and are only included for educational value and as starting points for your own research. No particular food, supplement, water, air, light, sound (music), life-style or relationship can be considered safe or desirable for all individuals. Therefore, no one can take responsibility for your health except you in consult with your trusted health professional.